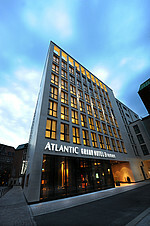 The ATLANTIC Grand Hotel Bremen sets new standards in the hotel sector in the federal state of Bremen. Whether as a traveller on business, a conference guest or a visitor to Bremen – you will spend the night and take part in meetings in a special ambience in the heart of the Old Town between Marktplatz, Böttcherstrasse and Weserpromenade Schlachte. Bremen is a beer town with a long tradition. Brauerei Beck & Co has its home in the Hanseatic city. Beck's with the key on its striking label is one of Bremen’s most famous ambassadors around the globe. If a city wants to stay attractive and lively, it has to be easy to access. As a municipal enterprise, BREPARK’s function is to make it easier to visit the city centre, in particular via individual means of transportation. What’s on in Bremen, where’s the best place to spend the night, what do I absolutely have to see? The Bremen Tourist Information Office (BTZ) answers these and other questions.